These pages provide the largest collection of Canadian Rockies webcam links you will find on the Internet. 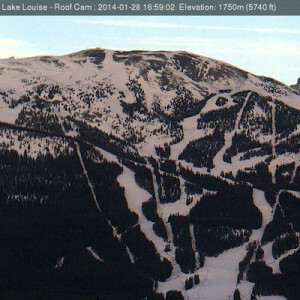 Rather than imbedding live streams, we’ve provided links to useful and reliable webcams spread through the Canadian Rockies. Click on the destinations on the right side of this page for these links. Webcam tip: Some webcams reload automatically each time the image is refreshed, while others require you to refresh manually (to do this on most browsers, press F5). Parks Canada uses webcams throughout the backcountry to study animal behaviour. Unfortunately, images are not streamed live to the public, but the agency often releases clips of the most interesting sightings and you’ll be able to watch them through various social media channel such as the Banff National Park Facebook page or the Parks Canada You Tube channel. Parks Canada also devotes a web page to short videos filmed in national parks across Canada. For example, A Wild Year—Banff National Park comprises footage from backcountry motion-activated cameras condensed from a full year in which you’ll see mountain goats, deer, black bears, grizzly bears, moose, elk, cougars, and even the odd human.